ImmiSoft covers up to 50% of the course fee. The rest of the course fee will be covered by Innove after you have passed the exam. The mission of ImmiSoft Ltd is to assist you to settle in Estonian Society by providing Estonian language and adaptation courses and developing interactive Estonian language video-courses for newcomers in Estonia. We have over 20 years of experience in the field of second language acquisition and teaching Estonian as a second language and we have developed all integration programs and Estonian language curricula for new immigrants in Estonia. 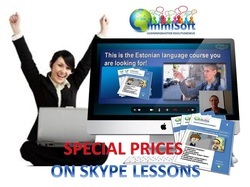 ImmiSoft Estonian language e-courses are designed by professional teacher trainers and researchers. Our teaching methods are based on recent brain research and language immersion methodology that makes the whole language learning process much more easier and productive. Although our main area is to provide free Estonian language and adaptation courses for third country nationals in Estonia, we also offer various Estonian language courses as well as interactive online video courses for all newcomers (including EU countries) in Estonia without any restrictions. See below a list of your great Estonian language learning options. ImmiSoft covers up to 50% of your course fee. Currently ImmiSoft provides Estonian language course without any restrictions to all and covers up to 50% of the course fee. The rest of the course fee will be covered by Innove after you have passed the A2, B1 or B2 level exam. The course fee is 3,90€ per hour of lessons, ImmiSoft covers up to 50% of the expenses, therefore the price for participants is only appr. 2,90 - 1,95 € per hour of lessons. In order to participate in this course you need to fill out the registration form! Estonian language courses at the level of A2, B1 and B2 (learning in a group) are for all English speaking newcomers without any restrictions. The Estonian language course consists of the basic A2-level Estonian education, which aims to give you the necessary primary knowledge of the Estonian language at the level (A2), which enables you to function independently in important areas of society. At the level of A2 you can understand simple sentences and frequently used expressions, you can communicate in simple and routine tasks in various daily situations requiring a simple and direct exchange of information on familiar and routine matters and describe in simple terms aspects of your background, immediate environment and matters in areas of immediate need. The total volume of the 0 - A2 course is 135 contact hours, 5 months, twice a week. The total volume of B1 and B2 courses is 90 contact hours. 58,80 € per 24 hrs (2,45 € per 1 hour. Usual price is 3,90€ ) 135.- € per 60 hrs (2,25 € per 1 hour) 276,75 € per 135 hrs (2,05 € per 1 hr, usual price is 3.90) All course materials are included. 58,80 € per 24hrs (2,45 € per 1 hr, usual price 3,90 € per 1 hr) 135.- € per 60 hrs (2,25 € per 1 hour), reg. price is 3,90) all materials included. You'll receive the invoice and your course schedule within 24 hours after registration. are supported by the interactive online materials and consider your individual needs. The BREAKTHROUGH course includes 30 hours of lessons via skype + 30 hours of individual work with online materials, downloadable worksheets, access to the video- and audiotasks and interactive exercises online. The courses are held by our professional teachers and teacher trainers. Certificate A2 Preparatory Courses 0-A2. The preparatory course for the A2 certificate is geared towards students with prior knowledge of Estonian to level A1. It deals with key topics from day-to-day life, such as health, orientation in the town and shopping, and in doing so builds upon basic grammatical knowledge. Certificate B1 - The preparatory course for the B1 certificate is geared towards students with prior knowledge of Estonian to level A2. It deals with key issues from day-to-day life, for example education, work, protecting the environment and media. The course rounds off the basic grammatical knowledge taught in the preparatory courses for certificates A1 and A2. You learn to express yourself freely in Estonian, in order to report about your personal situation, for example, or to be able to negotiate something with a partner. When it comes to reading, you acquire the ability to understand complicated everyday texts, such as newspaper advertisements or package information leaflets. You practise writing formal letters, such as applications or letters of complaint, and, with the help of listening exercises, learn to understand spoken Estonian in general, everyday situations, even when it is not spoken slowly and clearly. The course concludes with the Estonian test for immigrants (A2 - B1). Successful participation in the final examination is sufficient proof of satisfactory Estonian language skills for citizenship applications.